Martin Luther King said that 11 a.m. Sunday was the most segregated hour of the American week. He was referring to the segregation of white and black churches, of course. But 11 a.m. weekdays may be the most segregated hour in American schools. That’s lunchtime — and day after day, week after week, the same friends sit at the same tables. In Westport, the separation is not racial or religious. But it is segregation by friend groups. In nearly every cafeteria, the same groups sit together every day. Open to all high school students attending any Westport high school, and Westporters who attend high school elsewhere — and carrying prizes of $1,000, $750 and $500 — the contest asks entrants to describe barriers that prevent students from reaching out to others different from themselves. 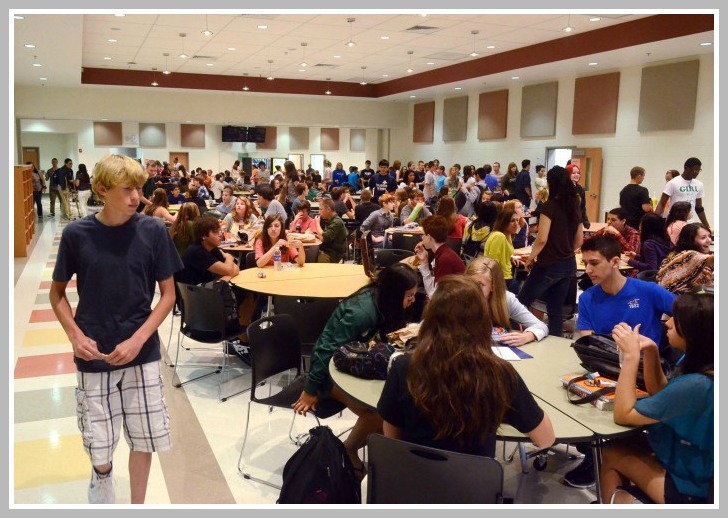 They should then “identify specific steps you and other students in your high school” can take to help students break down those barriers — “especially in the cafeteria.” Entrants are also asked to discuss the “risks and benefits” of making that effort. The contest follows last year’s very successful inaugural event. Students were asked to reflect on demographic changes in the US — describing the benefits and challenges of the changes for Westport generally, and him or her personally. Applications for the contest are available here. The deadline is February 27. “06880” will highlight the winners. This entry was posted in Children, Education, Organizations, religion, Staples HS, Teenagers and tagged "most segregated hour in America", Martin Luther King, TEAM Westport. Bookmark the permalink. I love this idea. I hope that those who participate will become agents of introspection and change. Thanks for the post, Dan. I hope lots of kids enter. Should we really be ramming this down teenagers throats? Kids like the kids they like. Why must we force a superficial “integration” just for the sake of it? Making new friends should be organic. Thanks, Dan. We’re grateful for your support! When we were kids we played musical chairs. It worked pretty well! Certainly, a way to learn a new language, to appreciate another culture. Our high school has a large Asian community, kids who are here to improve their English (maybe some French). However, it’s common for these kids to stick to their particular groups during lunch and outside of school. Only Japanese is offered, and so some friendships have been made, but we could benefit by Korean and Mandarin classes, too. All kids should be making an effort.